I admit it, I'm a snob. 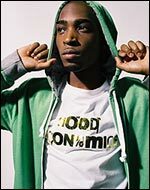 I refused to pay attention to Tinie Tempah's Pass Out when it first came out because it shared genetic material with Chipmunk and N-Dubz (not actual genetic material, of course, unless there's something sinister going on in the basement at Universal Records again). But after a couple of weeks of blanket radio play, I realised there was something a bit different going on. For starters, the lyrics were intelligent and funny - I actually chuckled the first time I noticed the line: "I got so many clothes I keep’s em in my aunts house". The production was a cut above the normal, too. So many UK R&B artists are content to loop the first idea that comes into their head and use it as the basis for an entire track (Taio Cruz's new single is essentially the same 16-beat phrase repeated for three minutes without any musical variation, progression or development). Tinie's track shot off in so many directions you could have mistaken it for a catherine wheel. Or the plot of a Tarantino movie. Or a better analogy than either of those. Now the 21-year-old is back with a new record. Like so many second singles, its a slightly-less-brilliant version of its predecessor. It's all about a foxy lady, and what Tinie plans to do with her in his boudoir. What a saucy devil. The lyrics are superb. Here are my favourites - you may have your own. :: "Would you risk it for a chocolate biscuit?" :: "Her dress from All Saints but I think I found a sinner." :: "I would put her in positions, like the mission, from my staircase to her kitchen." It can't just be me who fills in that pause with the word "gay", can it?